Esther is the best in the business! 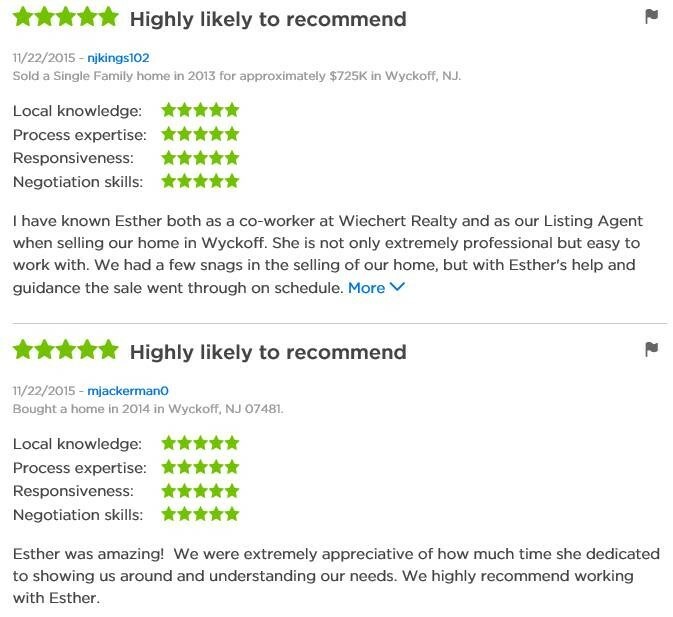 We had many issues with selling our townhouse and Esther was extremely patient, hardworking and dedicated through it all. She always kept us informed of what was going on and answered all questions we had throughout the process. She had many open houses, after which she followed up with prospective buyers and realtors. I cannot say enough good things about Esther, especially given the long, drawn out process that we went through. In the end, we sold and were successful and it was truly because of Esther's hard work! I would highly recommend her for first time home buyers, sellers or any time you need real estate needs! "Esther is truly one of the best in the business. She is extremely knowledgeable in all elements of real estate. Not only was she patient with us as we searched for our home, she patiently advised us through the the entire process. Esther goes the extra mile for her clients!" 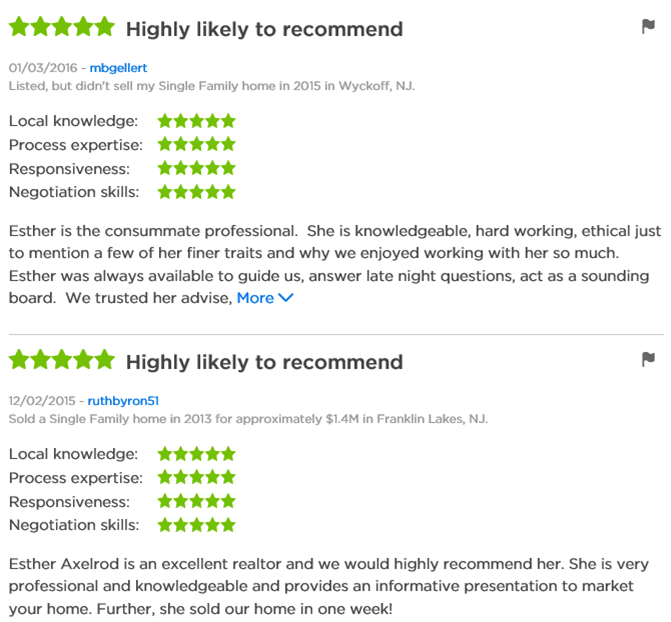 Esther Axelrod is a true “pro” in every sense of the word. Her vast experience in the real-estate business combined with her professionalism and congenial personality makes her the right choice to sell or buy your home. We faced a few challenges selling our home. Additionally, we encountered a complicated issue that could have caused further problems in selling our home. Esther met all the challenges and worked through the issues to deliver us a buyer on time (of our closing) and at our asking price. 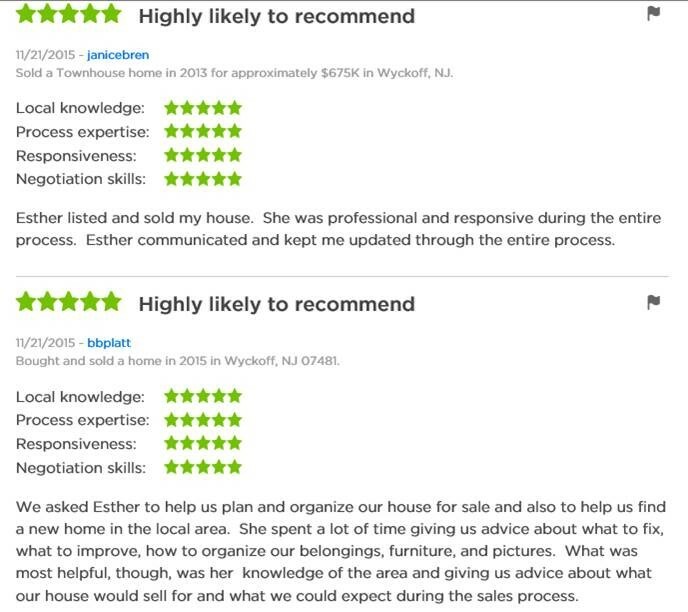 Esther takes the complexity and stress out of the home buying/selling equation. She is simply the best. "Thank you for your professional approach to our house and for your honest appraisal. At this time we decided not to list our house. Of the sales associates that we talked to you were the most professional." "We are so glad we had you to guide us through the whole house buying process and we truly love our new home. We will always recommend you to anyone looking!" Now that my house has closed, I have to tell you that Nancy and Esther were a fantastic team for us. They were there for us to negotiate the bidding war. Esther was the patient one letting me air my frustrations and countering with the reasonable possibilities. They were they dynamic duo who doubled teamed me and saved the day! They were always professional and extremely helpful. Esther always lept us up-to-date on progress. Our team worked tirelessly until the papers were signed and the deal was done. I would happily recommend them to anyone who is selling or buying a home. "Selling a home in today's market has become a unique experience. No homeowner can prepare for the emotionally, physical and financial extremes that accompany this transaction. Having a Realtor rises to meet each and every difficulty is a rare and exceptional find.The effort and diligence that you brought to our particular situation is truly appreciated. You were relentless in your effort to make our home, using every available advertising technique coupled with pricing corrections, as the market spiraled downward at an impossible rate. Although difficult, your advice and support brought us the desired result." "We also greatly appreciate your hard work in finding us the perfect townhouse to begin a new phase of our lives. You have continued to keep in touch as we prepare for our second closing and are always available to answer all questions. This is extremely important to clients who have not been in the housing market for many years. It is easy to understand why you are highly regarded and respected in your profession. 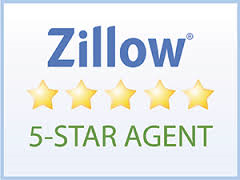 We have and will continue to recommend you as a true professional and trusted Realtor."